Two pieces of aluminum pipe are installed end to end on the floor. They are positioned approximately 8 - 12 inches (20 – 30 cm.) apart as if they were once a single pipe that has been cut and pulled apart. In one pipe, a 5-inch black-and-white monitor is mounted behind a lens that is flush with the end of the pipe. In the other pipe an 8-inch loud speaker is mounted flush to its end. Two other 8-inch speakers are mounted inside the pipes facing out the opposite ends. A spoken text is heard, sounding as if it is being funneled through the pipe onto the visible speaker. 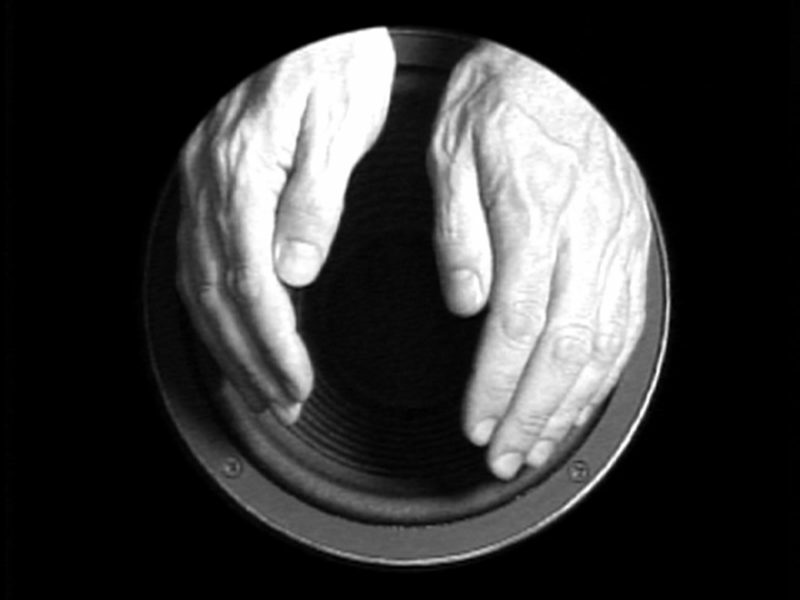 A video image of hands pressing into the skin of a speaker - touching and manipulating it - is projected across the gap directly on the skin of the speaker, which has been painted white. 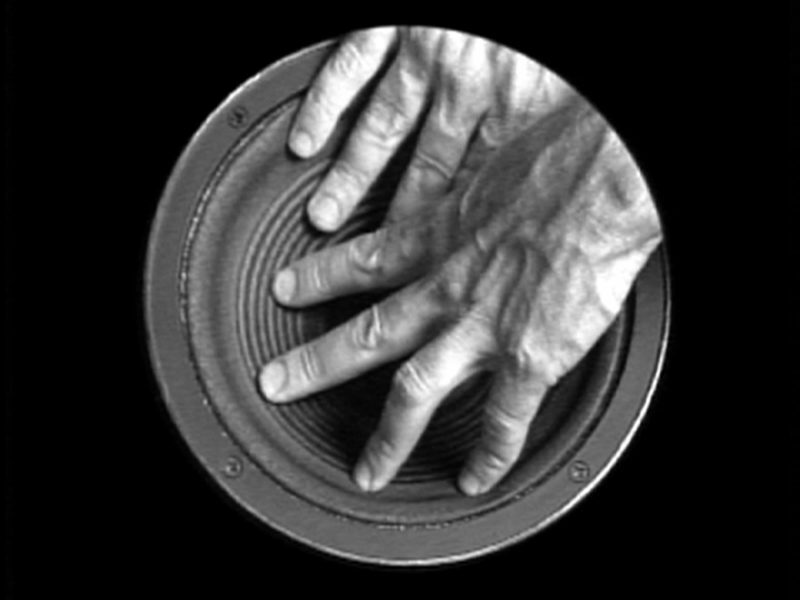 The cut pipe becomes a metaphorical cross-section of the relationship between sound and image connected by the body. This central idea is reinforced by the literal projection of the image of the speaker / object onto the object itself and the spoken self-reflexive text that interacts with the physical manipulation of the speaker by the hands at the membrane of physicality - the skin of the object / speaker. 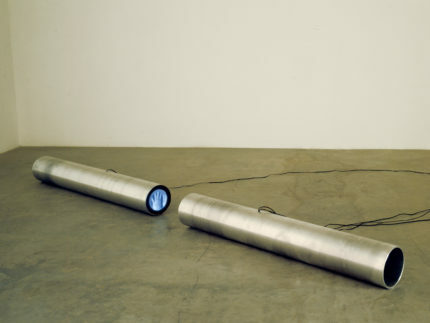 An example of this work was first exhibited by the Donald Young Gallery at Basel 23’92, Basel, Switzerland, June 17 – 22, 1992. Solo exhibition. Donald Young Gallery, Seattle, Washington, January 29 – March 12, 1993. “Gary Hill: Sites Recited,” Long Beach Museum of Art, Long Beach, California, December 3, 1993 – February 20, 1994. 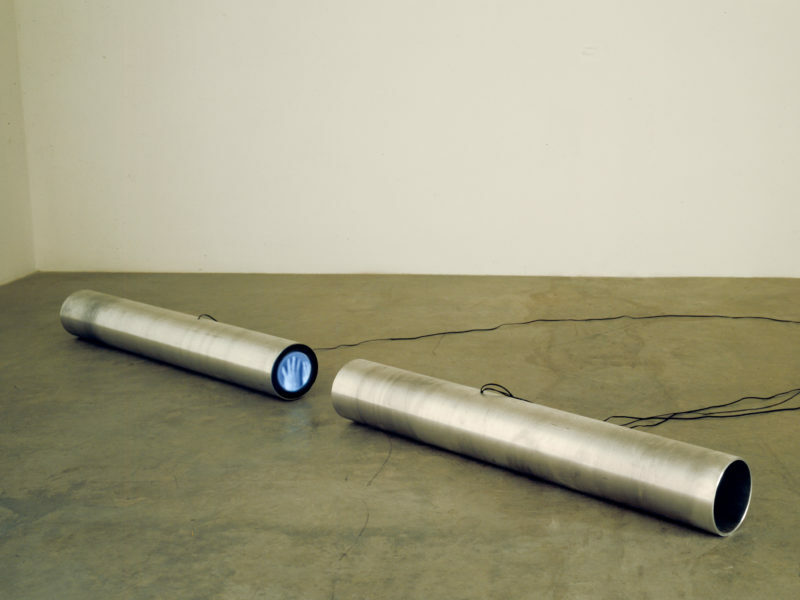 “Altered States: American Art in the ‘90s,” Forum for Contemporary Art, St. Louis, Missouri, March 24 – May 6, 1995. 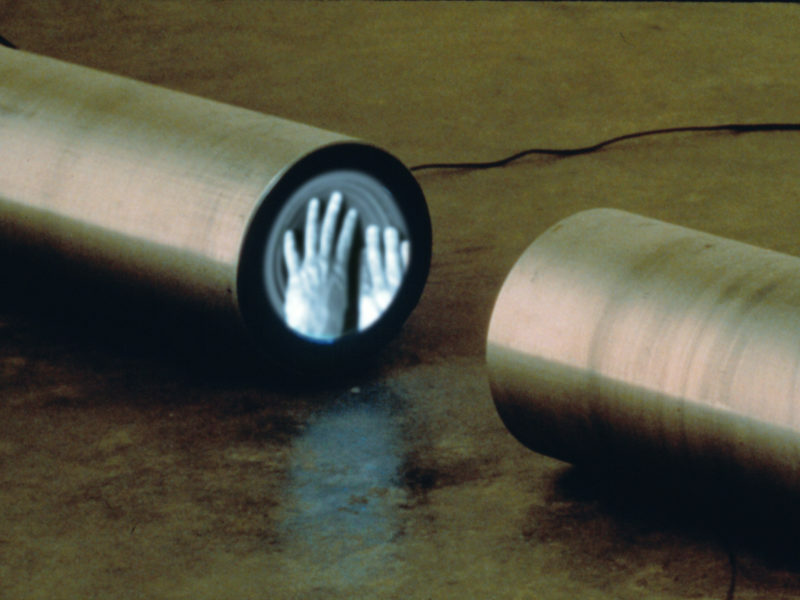 “Sonambiente,” Akademie der Künste, Berlin, Germany, August 9 – September 8, 1996. “Crossings,” Kunsthalle Wien, Vienna, Austria, May 29 – September 13, 1998; Rudolfinum, Prague, Czech Republic, June 24 – September 12, 1999. “Seeing Time: Selections from the Richard and Pamela Kramlich Collection of Media Art,” San Francisco Museum of Modern Art, San Francisco, California, October 15, 1999 – January 9, 2000; Zentrum für Kunst und Medientechnologie (ZKM), Karlsruhe, Germany, November 29, 2000 – April 22, 2001. “Image, Body, Text: Selected Works by Gary Hill,” San Francisco Museum of Modern Art, San Francisco, California, March 24 – May 30, 2005. TONSPUR_expanded III, MuseumsQuartier, Vienna, Austria, December 10, 2010 - February 20, 2011. Van Assche, Christine. Gary Hill. Paris: Editions du Centre Georges Pompidou, 1992, pp. 82, 83. Van Assche, Christine and Corinne Diserens. Gary Hill. Valencia: Instituto Valenciano de Arte Moderno (IVAM), Centre del Carme, 1993, pp. 86, 87. Smallwood, Lyn. “Gary Hill’s skin flicks.” Seattle Weekly (March 3, 1993). Slemmons, Rod. "Gary Hill. Under New Skins." Reflex (May/June 1993), p. 13. Grout, Catherine. "Gary Hill – La condition humaine de la pensee." Arte Factum 48 (June/July/August 1993), p. 12. Failing, Patricia. “Donald Young Gallery, Seattle.” Artnews 92 (September 1993), p. 182. Bruce, Chris. Gary Hill. Seattle, Washington: Henry Art Gallery, University of Washington, 1994, pp. 54 – 59. Willis, Holly. “The Unknown That Knows Where the Hole in the Mind Resides: Installations and Videos by Gary Hill at the Long Beach Museum of Art.” Video Networks, San Francisco (February/March 1994), p. 21. Altered States: American Art in the 90’s. St. Louis, Missouri: Forum for Contemporary Art, 1995, p. 14. Klangkunst - Sonambiente festival für hören und sehen. Berlin: Akademie der Kunste, 1996, p. 71. Quasha, George and Charles Stein. Tall Ships. Gary Hill’s Projective Installations 2. Barrytown, New York: Station Hill Arts, 1997, p. 7. Quasha, George and Charles Stein. Viewer. Gary Hill’s Projective Installations 3. Barrytown, New York: Station Hill Arts, 1997, p. 9. Liesbrock, Heinz. Gary Hill: Midnight Crossing. Münster: Westfälischer Kunstverein, 1997, pp. 20 – 22. Crossings: Kunst zum Hören und Sehen. Vienna: Kunsthalle Wien, 1998, pp. 166, 167. Kunstmuseum Wolfsburg Gesammelte Werke 1 Zeitgenössische Kunst seit 1968. Wolfsburg: Kunstmuseum Wolfsburg, 1999, p. 224, 225. Seeing Time: Selections from the Pamela and Richard Kramlich Collection of Media Art. San Francisco: San Francisco Museum of Modern Art, 1999, pp. 46, 124 - 127. Sullivan, Missy. “Pixel Picassos.” FORBES (November 15, 1999), p. 320. Marclay, Christian and Gary Hill. “Christian Marclay / Gary Hill: Conversation,” Annandale (Bard College), Vol. 139, No. 1 (Spring 2000), p. 7. Gary Hill en Argentina: textos, ensayos, dialogos. Buenos Aires: Centro Cultural Recoleta, 2000, pp. 19 - 20. Quasha, George and Charles Stein. La performance elle-même in Gary Hill: Around & About: A Performative View. Paris: Éditions du Regard, 2001, pp. 7 – 9, 34 – 35. Gary Hill: Selected Works and catalogue raisonné. (Wolfsburg: Kunstmuseum Wolfsburg, 2002), GHCR 74, pp. 163 – 165. Rush, Michael. “A Résumé of Surfing and Philosophy as Well as Art.” The New York Times (September 15, 2002), pp. 31 – 32. Odin, Paul-Emmanuel. L’absence de livre [Gary Hill et Maurice Blanchot – Écriture, vidéo]. Marseille: La Compagnie, 2007, pp. 151 - 153. Meigh-Andrews, Chris and Aneta Krzemien, eds. Digital Aesthetic 2. Preston: Electronic and Digital Art Unit (EDAU), University of Central Lancashire, 2008), pp. 42 – 43. Quasha, George and Charles Stein. An Art of Limina: Gary Hill’s Works and Writings. Barcelona: Ediciones Polígrafa, 2009, pp. 10, 37, 45, 47, 281 – 293, 427, 429, 575.